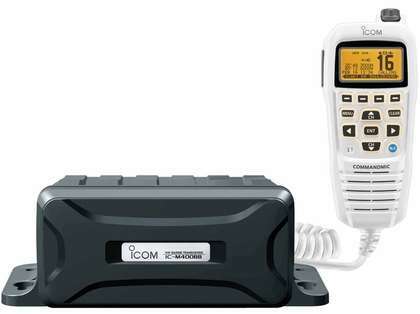 The Icom M400BB SW Black Box VHF Marine Transceiver is ideal when space is at a premium! The Icom M400BB is a VHF fixed mount with Class-D DSC. This spacesaving VHF Marine Transceiver is ideal for compact boat owners and shipbuilders looking for a black box solution. The M400BB is made up of a black box main body and an included COMMANDMIC HM195 remote control white microphone. The two-piece radio set is easy to install behind a wall or console, leaving a small or hidden footprint while allowing for complete control from a remote position. Although compact in size, the Icom M400BB possesses the same robust functionality that is found in the Icom M424 VHF fixed mount. Features include COMMANDMIC intuitive soft-key interface design, Class D DSC, active noise cancelling, public address (PA), and a 10W loudspeaker for optimal audio performance. The M400MB Transceiver is compatible with Icom's MA-500TR AIS transponder for additional safety at sea.